Am I the only one who feels unproductive some of the time? It seems that I never have enough time to get it all done. I try getting up super early to get ahead, but then my kid wakes up at 5:30am. My work is consuming my mind well into the evening. My side projects never get off the ground. Can anyone relate? I know a few childless business acquaintances who believe that with all parents gain from being parents, time might be the one thing we lose. Do the kid-less get more done because they have more time to work on there passions, art and self? I don’t think so. Many dads live exceptional lives, making it all work – family, heath, career. I’m still a work in progress and always will be. I’m seeing results. The efforts I’ve put into studying productivity and time management to efficiently become more successful as a dad, husband, in my career and with myself are starting to pay off. I’ll soon release a series of posts with my ups and downs in self development, starting with productivity. Hopefully, you’ll glean some ideas too. To start, I’m posting a video from RSA Animate. RSA does really fascinating short video lectures where the speaker talks through a topic while someone animates the concepts on a whiteboard. 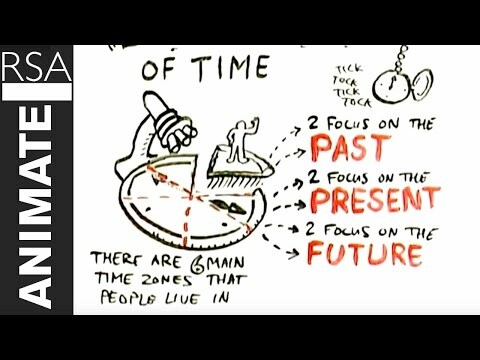 This video is about our perspective on time. Professor Zimbardo is Professor Emeritus at Stanford University and well known for his work in psychology and his famous prison experiment. In his talk, he demonstrates how time influences who we are as a person, how we view relationships and how we act in the world. I think it’s fascinating. It’s 10 minutes and worth the time. Enjoy.